Moving on to Type 2 locomotives, we currently have five of these in our fleet and all them, except one, are in weathered condition. 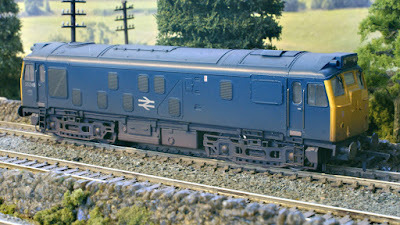 The North British diesel-hydraulic Class 22, or 'Baby Warship' as she was also known due to its similarity to the BR Class 41 Warship Class of locomotive. The Class 22 was introduced in 1959 and consisted of 58 locomotives, numbered D6300-D6357. Initially there were problems with the transmission and the engines, albeit these were nowhere near as bad as those issues with the company's diesel-electric equivalent Class 21 locomotives. Besides which, following repairs by NBL their reliability did improve somewhat although they were soon displaced by the more powerful Hymeks and Class 42 Warships. 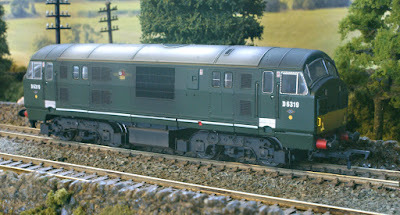 Our model is by Dapol (Catalogue Nº: D1000d) and is a great little runner. It has a Howes DCC sound decoder fitted and is used on similar duties to it bigger sisters, namely, freight workings, local passenger trains and ECS workings. Sadly, none of these locos survived into preservation although D6319 was purchased from BR but was cut up at Swindon before the purchaser could save it from the cutter's torch. One Locomotive (D6319) was purchased by a private individual from BR, but it was cut up at Swindon before the buyer could retrieve it. On a more positive note, 'The Project Class 22 Society' do plan to build a new locomotive and their website, for those who are interested, is here www.project22society.co.uk. 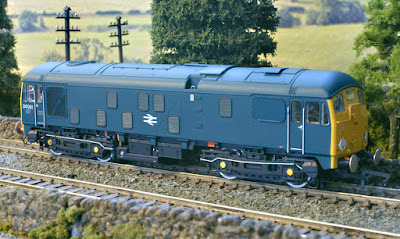 Built by English Electric at its Vulcan Foundry, the Class 23, or Baby Deltics, were another small class of locomotives, numbering only 10 in the fleet. It used the Napier Deltic T9-29 9-cylinder engine of 1,100 bhp, a single version of the engine used in the Class 55 locomotive. As with the Class 22's, they were introduced in 1959 but, unfortunately, this was another prototype diesel that was beset with problems and they were all withdrawn by 1971. 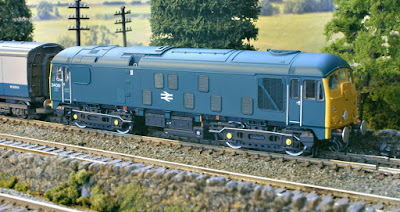 Once again, none of the fleet survived although one of the Napier T29 engines did avoid being cut-up and this is now being used (together with the body of 37372) by the Baby Deltic Project to build a new Class 23 - D5310. As with the prototypes, our Heljan model (Catalogue Nº 2323) also gave us a few problems in that the drive shaft kept dropping out. I replaced it myself a couple of times but eventually decided to send it back to Howes who managed to effect a more permanent repair. Our loco has been weathered and is fitted with a Howes DCC sound decoder and she does sound amazing. We use her for a variety of tasks from frieght to ECs to both local and semi-fast passenger work. D5909 was also the only member of the class to receive the full rail-blue livery. 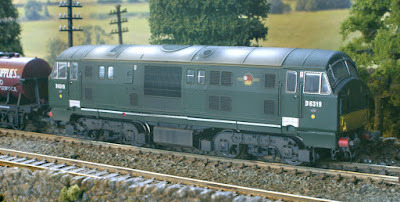 Our model of the Class 24 (24081) is by the Sutton Locomotive Works (Catalogue Nº: 2402) and is a great model in so many ways. She looks fantastic, she sounds amazing and is just like the real locomotive to drive! She is fitted with DCC sound (plus stay-alive capacitor) and has two speakers, which means her sound quality is awesome. The model also features the later exhaust arrangement, exposed solebars and plated over front doors. The class numbered 151 locos and were built between 1958 and 1961 with 24081 being the last one to be withdrawn in October 1980. It is also one of only four of the class to have been preserved. 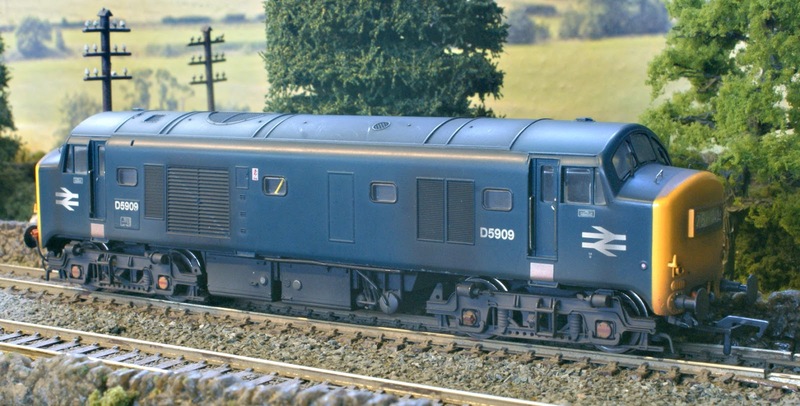 Our model is very much a mixed traffic loco and can be seen on a variety of goods trains as well as on both local and semi-fast passenger workings. So popular is this loco with us that we have put in an order for a two-tone green version (D5040) due to be available in the summer. Our Class 25 locomotive is by Bachmann and, in fact, she started out as 25245 (Catalogue Nº: 32-326DS) although we later had her weathered and renumbered as 25248. She also originally she came with Bachmann's factory-fitted DCC sound files but we have since had her reblown with Howes sound files. There were 327 Class 25's built, between 1961 and 1967 and so ubiquitous were they that they became known as 'Rats' by trainspotters. The final 25 was withdrawn in March 1987 but, happily, 20 of the class were saved for posterity although, sadly, neither 25245 nor 25248 is amongst those preserved. 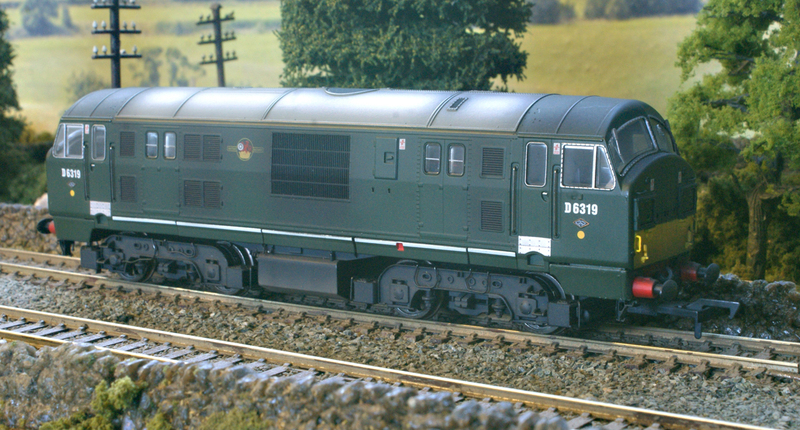 Our final Type 2 locomotive, at least for the moment, is this Hornby Class 31, 31268, Catalogue Nº: R2413B. She came factory-weathered and we have not added to that weathering although, as with most of our locos, she has been fitted with a Howes DCC sound decoder. She is a great loco, too, and sounds fantastic although, of late, she has started giving us trouble by frequently derailing, especially on points. I am not sure why this is and is something that we need to investigate. The prototype Class 31's became the BR standard Class 2 locomotives and 263 of them were built between 1957 and 1962. Such was their success that 26 of the class have been purchased / preserved (although unfortunately not 31268) and they can still occasionally be seen on the main line today. Our loco, when she is running well, can be seen in charge of the same variety of trains that the prototypes could be seen handling across the BR network.